Moigniez was well known for his birds but he also did several fine modles of hunting dogs. This sculpture shows a Setter as he retrieves a Pheasant for the hunter in his soft mouth. 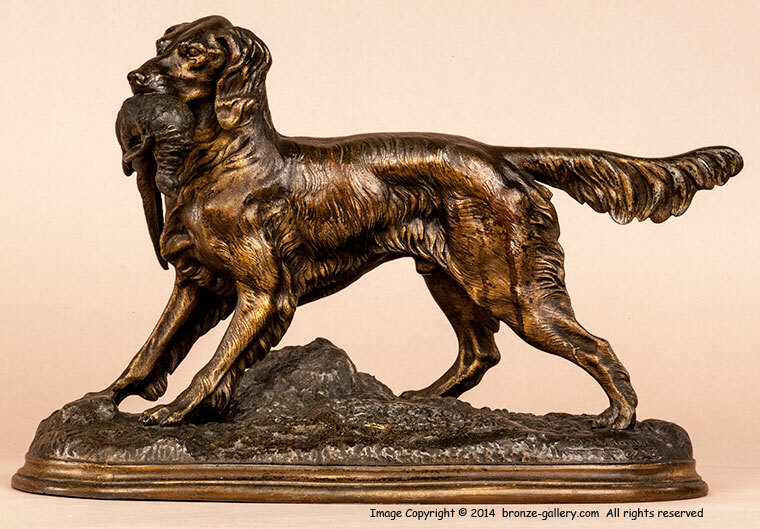 Moigniez also did a much larger bronze of a Setter carrying a Pheasant, but this is a completely different subject. The Setter carefully holds the Pheasant, ready to bring the game bird back to his master. 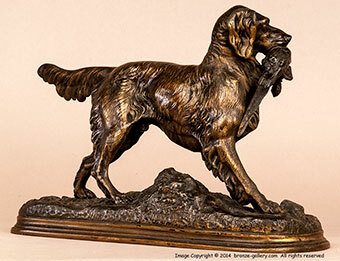 Moigniez has captured the soft fur and plumed tail of this favorite hunting dog with accuracy. The sculpture is made of Regule which is a zinc alloy often used in the mid 19th century for casting sculptures. Usually one finds the works of Comolera, Gayrard, and Arson done in Regule or white bronze, and it is rare to see a sculpture by Moigniez cast in this metal. Bronze metal was quite expensive in the 19th century and many sculptors had their works cast in Regule due to the high cost of bronze metal.